The facility was nice but not the rooms. The bathroom was so small, and they dis not clean the bathroom everyday, the tub was clogged and the towels were so rough on the skin! We have stayed there a decent amount when it’s on sale for around $60 a night it’s a good place to stay to save some money but def not worth any more the internet didn’t work in the building we were in and when we asked they just said oh that building isn’t good next time request a room in a different one, the housekeeping and maintenance staff don’t speak English so just hard to communicate and get issues resolved. I liked the convenience of the location. I liked the beds in the room were comfortable. The pool was nice. The Pizza Hut on site was great in a pinch. It was high season and I was glad I could get a room in the Orlando area and it was only for one night. That said, there weee too many small things that were poor to overlook. The wait time to check in and check out was way, way too long. The phone in the room didn’t work so I couldn’t get in touch with the front desk. The cover for the remote in the TV was missing and the batteries would fall out. Small things like that. 3 pools so always one close to any room. Ice machines were broke, pop machines were empty. Room was clean staff was helpful and polite. Only one pool is heated. Maid service never came had to call to replace towels. Overall not a bad stay for the price.would stay again. Great outdoor spaces. Disappointed in Reds Bar & Grill. Given a paper sheet menu that only showed a few items compared to menu in the room. Happy hour prices are way too high !! Did not stay to drink or dine. Located 2.7 mi (4.4 km) from Disney's Animal Kingdom® Theme Park, Red Lion Hotel Orlando - Kissimmee Maingate is within a 10-minute drive of other popular attractions like Disney's Fantasia Gardens Miniature Golf Course. This 516-room, 3-star hotel welcomes guests with 4 outdoor pools, 2 restaurants, and free in-room WiFi. Enjoy dining at Red's Bar andGrill, one of 2 onsite restaurants. At the end of the day, relax with a drink at the bar/lounge. For your convenience, a buffet breakfast is served for a fee each morning from 7:00 AM to 11:00 AM. Guests can expect to find free WiFi and 32-inch a flat-screen TV with cable channels. Beds sport premium bedding and the bathroom offers a hair dryer and designer toiletries. Other standard amenities include an iPod dock, a refrigerator, and a coffee maker. 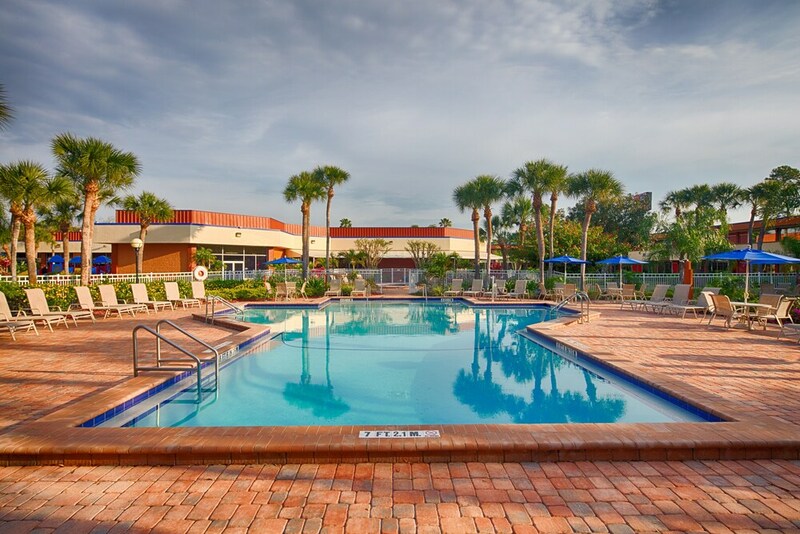 Guests of Red Lion Hotel Orlando - Kissimmee Maingate enjoy 4 outdoor pools, a children's pool, and a fitness center. You can take advantage of free parking, along with an area shuttle for a fee. Multilingual staff at the 24-hour front desk can assist with dry cleaning/laundry, concierge services, and luggage storage. Other amenities at this family-friendly hotel include an outdoor tennis court, free WiFi in public areas, and a business center. Thank you for your rating. We hope to see you again soon! Thank you for sharing your review. We are pleased you enjoyed our location and accommodations. We hope to see you again soon! Red's Bar andGrill - Restaurant and bar open select days for dinner. Kid's menu available. Pizza Hut Express - Family restaurant. Open daily. Red Lion Hotel Orlando - Kissimmee Maingate features an outdoor tennis court and complimentary bicycles. The hotel has 4 outdoor swimming pools and a children's pool. Other recreation options include a fitness center.